1 E None No Power Seat 1 E is a standard First Class Bulkhead seat. 17 A None No Power Seat 17 A is a standard Economy Class Bulkhead seat. Passengers traveling with infants are often seated here as there are bassinets in this row. The tray table is in the armrest, making the armrest immovable and slightly reducing seat width. There may be no floor storage during take-off and landing. 17 B None No Power Seat 17 B is a standard Economy Class Bulkhead seat. Passengers traveling with infants are often seated here as there are bassinets in this row. The tray table is in the armrest, making the armrest immovable and slightly reducing seat width. There may be no floor storage during take-off and landing. 17 C None No Power Seat 17 C is a standard Economy Class Bulkhead seat. Passengers traveling with infants are often seated here as there are bassinets in this row. The tray table is in the armrest, making the armrest immovable and slightly reducing seat width. There may be no floor storage during take-off and landing. 17 D None No Power Seat 17 D is a standard Economy Class Bulkhead seat. Passengers traveling with infants are often seated here as there are bassinets in this row. The tray table is in the armrest, making the armrest immovable and slightly reducing seat width. There may be no floor storage during take-off and landing. 17 E None No Power Seat 17 E is a standard Economy Class Bulkhead seat. Passengers traveling with infants are often seated here as there are bassinets in this row. The tray table is in the armrest, making the armrest immovable and slightly reducing seat width. There may be no floor storage during take-off and landing. 17 F None No Power Seat 17 F is a standard Economy Class Bulkhead seat. Passengers traveling with infants are often seated here as there are bassinets in this row. The tray table is in the armrest, making the armrest immovable and slightly reducing seat width. There may be no floor storage during take-off and landing. 17 G None No Power Seat 17 G is a standard Economy Class Bulkhead seat. Passengers traveling with infants are often seated here as there are bassinets in this row. The tray table is in the armrest, making the armrest immovable and slightly reducing seat width. There may be no floor storage during take-off and landing. 17 H None No Power Seat 17 H is a standard Economy Class Bulkhead seat. Passengers traveling with infants are often seated here as there are bassinets in this row. The tray table is in the armrest, making the armrest immovable and slightly reducing seat width. There may be no floor storage during take-off and landing. 17 J None No Power Seat 17 J is a standard Economy Class Bulkhead seat. Passengers traveling with infants are often seated here as there are bassinets in this row. The tray table is in the armrest, making the armrest immovable and slightly reducing seat width. There may be no floor storage during take-off and landing. 17 K None No Power Seat 17 K is a standard Economy Class Bulkhead seat. Passengers traveling with infants are often seated here as there are bassinets in this row. The tray table is in the armrest, making the armrest immovable and slightly reducing seat width. There may be no floor storage during take-off and landing. 2 E None No Power Seat 2 E is a standard First Class seat. There is a bassinet location here, so passengers traveling with infants are often seated in this row. 2 F None No Power Seat 2 F is a standard First Class seat. There is a bassinet location here, so passengers traveling with infants are often seated in this row. 21 A None No Power Seat 21 A is an Economy Class seat that may have limited recline and the close proximity to the lavatories behind may be bothersome. 21 B None No Power Seat 21 B is an Economy Class seat that may have limited recline and the close proximity to the lavatories behind may be bothersome. 21 C None No Power Seat 21 C is an Economy Class seat that may have limited recline and the close proximity to the lavatories behind may be bothersome. 21 D None No Power Seat 21 D is an Economy Class seat that may have limited recline and the close proximity to the lavatories behind may be bothersome. 21 E None No Power Seat 21 E is an Economy Class seat that may have limited recline and the close proximity to the lavatories behind may be bothersome. 21 F None No Power Seat 21 F is an Economy Class seat that may have limited recline and the close proximity to the lavatories behind may be bothersome. 21 G None No Power Seat 21 G is an Economy Class seat that may have limited recline and the close proximity to the lavatories behind may be bothersome. 21 H None No Power Seat 21 H is an Economy Class seat that may have limited recline and the close proximity to the lavatories behind may be bothersome. 21 J None No Power Seat 21 J is an Economy Class seat that may have limited recline and the close proximity to the lavatories behind may be bothersome. 21 K None No Power Seat 21 K is an Economy Class seat that may have limited recline and the close proximity to the lavatories behind may be bothersome. 23 D None No Power Seat 23 D is an Economy Class Exit Row seat that may have extra legroom however the close proximity to the lavatories may be bothersome. Passengers traveling with infants are often seated here as there are bassinets at this row. The tray table and TV are in the armrest, making the armrest immovable and slightly reducing seat width. There may be no floor storage during take-off and landing. 23 E None No Power Seat 23 E is an Economy Class Exit Row seat that may have extra legroom however the close proximity to the lavatories may be bothersome. Passengers traveling with infants are often seated here as there are bassinets at this row. The tray table and TV are in the armrest, making the armrest immovable and slightly reducing seat width. There may be no floor storage during take-off and landing. 23 F None No Power Seat 23 F is an Economy Class Exit Row seat that may have extra legroom however the close proximity to the lavatories may be bothersome. Passengers traveling with infants are often seated here as there are bassinets at this row. The tray table and TV are in the armrest, making the armrest immovable and slightly reducing seat width. There may be no floor storage during take-off and landing. 23 G None No Power Seat 23 G is an Economy Class Exit Row seat that may have extra legroom however the close proximity to the lavatories may be bothersome. Passengers traveling with infants are often seated here as there are bassinets at this row. The tray table and TV are in the armrest, making the armrest immovable and slightly reducing seat width. There may be no floor storage during take-off and landing. 24 A None No Power Seat 24 A is an Economy Class Exit Row seat that may have extra legroom however the close proximity to the lavatories may be bothersome. Passengers traveling with infants are often seated here as there are bassinets at this row. The tray table and TV are in the armrest, making the armrest immovable and slightly reducing seat width. There may be no floor storage during take-off and landing. 24 B None No Power Seat 24 B is an Economy Class Exit Row seat that may have extra legroom however the close proximity to the lavatories may be bothersome. Passengers traveling with infants are often seated here as there are bassinets at this row. The tray table and TV are in the armrest, making the armrest immovable and slightly reducing seat width. There may be no floor storage during take-off and landing. 24 C None No Power Seat 24 C is an Economy Class Exit Row seat that may have extra legroom however the close proximity to the lavatories may be bothersome. Passengers traveling with infants are often seated here as there are bassinets at this row. The tray table and TV are in the armrest, making the armrest immovable and slightly reducing seat width. There may be no floor storage during take-off and landing. 24 H None No Power Seat 24 H is an Economy Class Exit Row seat that may have extra legroom however the close proximity to the lavatories may be bothersome. Passengers traveling with infants are often seated here as there are bassinets at this row. The tray table and TV are in the armrest, making the armrest immovable and slightly reducing seat width. There may be no floor storage during take-off and landing. 24 J None No Power Seat 24 J is an Economy Class Exit Row seat that may have extra legroom however the close proximity to the lavatories may be bothersome. Passengers traveling with infants are often seated here as there are bassinets at this row. The tray table and TV are in the armrest, making the armrest immovable and slightly reducing seat width. There may be no floor storage during take-off and landing. 24 K None No Power Seat 24 K is an Economy Class Exit Row seat that may have extra legroom however the close proximity to the lavatories may be bothersome. Passengers traveling with infants are often seated here as there are bassinets at this row. The tray table and TV are in the armrest, making the armrest immovable and slightly reducing seat width. There may be no floor storage during take-off and landing. 36 A None No Power Seat 36 A is an Economy Class seat that may have limited recline. The close proximity to the lavatories and galley may be bothersome. 36 B None No Power Seat 36 B is an Economy Class seat that may have limited recline. The close proximity to the lavatories and galley may be bothersome. 36 C None No Power Seat 36 C is an Economy Class seat that may have limited recline. The close proximity to the lavatories and galley may be bothersome. 36 D None No Power Seat 36 D is an Economy Class seat that may have limited recline. The close proximity to the lavatories and galley may be bothersome. 36 E None No Power Seat 36 E is an Economy Class seat that may have limited recline. The close proximity to the lavatories and galley may be bothersome. 36 F None No Power Seat 36 F is an Economy Class seat that may have limited recline. The close proximity to the lavatories and galley may be bothersome. 36 G None No Power Seat 36 G is an Economy Class seat that may have limited recline. The close proximity to the lavatories and galley may be bothersome. 36 H None No Power Seat 36 H is an Economy Class seat that may have limited recline. The close proximity to the lavatories and galley may be bothersome. 36 J None No Power Seat 36 J is an Economy Class seat that may have limited recline. The close proximity to the lavatories and galley may be bothersome. 36 K None No Power Seat 36 K is an Economy Class seat that may have limited recline. The close proximity to the lavatories and galley may be bothersome. 37 A None No Power Seat 37 A is an Economy Class Exit Row seat that may have extra legroom, however the close proximity to the galleys may be bothersome. The tray table is in the armrest, making the armrest immovable and slightly reducing seat width. There may be no floor storage during take-off and landing. 37 B None No Power Seat 37 B is an Economy Class Exit Row seat that may have extra legroom, however the close proximity to the galleys may be bothersome. The tray table is in the armrest, making the armrest immovable and slightly reducing seat width. There may be no floor storage during take-off and landing. 37 C None No Power Seat 37 C is an Economy Class Exit Row seat that may have extra legroom, however the close proximity to the galleys may be bothersome. The tray table is in the armrest, making the armrest immovable and slightly reducing seat width. There may be no floor storage during take-off and landing. 37 H None No Power Seat 37 H is an Economy Class Exit Row seat that may have extra legroom, however the close proximity to the galleys may be bothersome. The tray table is in the armrest, making the armrest immovable and slightly reducing seat width. There may be no floor storage during take-off and landing. 37 J None No Power Seat 37 J is an Economy Class Exit Row seat that may have extra legroom, however the close proximity to the galleys may be bothersome. The tray table is in the armrest, making the armrest immovable and slightly reducing seat width. There may be no floor storage during take-off and landing. 37 K None No Power Seat 37 K is an Economy Class Exit Row seat that may have extra legroom, however the close proximity to the galleys may be bothersome. The tray table is in the armrest, making the armrest immovable and slightly reducing seat width. There may be no floor storage during take-off and landing. 38 D None No Power Seat 38 D is an Economy Class Bulkhead seat that may have restricted legroom. Passengers traveling with infants are often seated here as there are bassinets in this row. The tray table is in the armrest, making the armrest immovable and slightly reducing seat width. There may be no floor storage during take-off and landing. 38 E None No Power Seat 38 E is an Economy Class Bulkhead seat that may have restricted legroom. Passengers traveling with infants are often seated here as there are bassinets in this row. The tray table is in the armrest, making the armrest immovable and slightly reducing seat width. There may be no floor storage during take-off and landing. 38 F None No Power Seat 38 F is an Economy Class Bulkhead seat that may have restricted legroom. Passengers traveling with infants are often seated here as there are bassinets in this row. The tray table is in the armrest, making the armrest immovable and slightly reducing seat width. There may be no floor storage during take-off and landing. 38 G None No Power Seat 38 G is an Economy Class Bulkhead seat that may have restricted legroom. Passengers traveling with infants are often seated here as there are bassinets in this row. The tray table is in the armrest, making the armrest immovable and slightly reducing seat width. There may be no floor storage during take-off and landing. 45 C None No Power Seat 45 C is an Economy Class seat that juts out into the aisle and may be bumped by service carts or others passing by. 45 H None No Power Seat 45 H is an Economy Class seat that juts out into the aisle and may be bumped by service carts or others passing by. 46 A None No Power Seat 46 A is an Economy Class seat that is misaligned with the seats in front. The floor anchors from the seats ahead may interfere with your legroom. However this seat may be preferable by those who are traveling with a companion as this is one of the only coupled seats in Economy. 46 B None No Power Seat 46 B is an Economy Class seat that is misaligned with the seats in front. The floor anchors from the seats ahead may interfere with your legroom. However this seat may be preferable by those who are traveling with a companion as this is one of the only coupled seats in Economy. 46 J None No Power Seat 46 J is an Economy Class seat that is misaligned with the seats in front. The floor anchors from the seats ahead may interfere with your legroom. However this seat may be preferable by those who are traveling with a companion as this is one of the only coupled seats in Economy. 46 K None No Power Seat 46 K is an Economy Class seat that is misaligned with the seats in front. The floor anchors from the seats ahead may interfere with your legroom. However this seat may be preferable by those who are traveling with a companion as this is one of the only coupled seats in Economy. 47 A None No Power Seat 47 A is a standard Economy Class seat. Passengers traveling with a companion may prefer this seat as it is one of the only coupled seats in Economy. 47 B None No Power Seat 47 B is a standard Economy Class seat. Passengers traveling with a companion may prefer this seat as it is one of the only coupled seats in Economy. 47 J None No Power Seat 47 J is a standard Economy Class seat. Passengers traveling with a companion may prefer this seat as it is one of the only coupled seats in Economy. 47 K None No Power Seat 47 K is a standard Economy Class seat. Passengers traveling with a companion may prefer this seat as it is one of the only coupled seats in Economy. 48 A None No Power Seat 48 A is a standard Economy Class seat. Passengers traveling with a companion may prefer this seat as it is one of the only coupled seats in Economy. 48 B None No Power Seat 48 B is a standard Economy Class seat. Passengers traveling with a companion may prefer this seat as it is one of the only coupled seats in Economy. 48 J None No Power Seat 48 J is a standard Economy Class seat. Passengers traveling with a companion may prefer this seat as it is one of the only coupled seats in Economy. 48 K None No Power Seat 48 K is a standard Economy Class seat. Passengers traveling with a companion may prefer this seat as it is one of the only coupled seats in Economy. 49 A None No Power Seat 49 A is a standard Economy Class seat. Passengers traveling with a companion may prefer this seat as it is one of the only coupled seats in Economy. 49 B None No Power Seat 49 B is a standard Economy Class seat. Passengers traveling with a companion may prefer this seat as it is one of the only coupled seats in Economy. 49 J None No Power Seat 49 J is a standard Economy Class seat. Passengers traveling with a companion may prefer this seat as it is one of the only coupled seats in Economy. 49 K None No Power Seat 49 K is a standard Economy Class seat. Passengers traveling with a companion may prefer this seat as it is one of the only coupled seats in Economy. 50 A None No Power Seat 50 A is an Economy Class seat in the last row of the plane. This seat may have limited recline and the close proximity to the galley and lavatories may be bothersome. 50 B None No Power Seat 50 B is an Economy Class seat in the last row of the plane. This seat may have limited recline and the close proximity to the galley and lavatories may be bothersome. 50 D None No Power Seat 50 D is an Economy Class seat in the last row of the plane. This seat may have limited recline and the close proximity to the galley and lavatories may be bothersome. 50 E None No Power Seat 50 E is an Economy Class seat in the last row of the plane. This seat may have limited recline and the close proximity to the galley and lavatories may be bothersome. 50 F None No Power Seat 50 F is an Economy Class seat in the last row of the plane. This seat may have limited recline and the close proximity to the galley and lavatories may be bothersome. 50 G None No Power Seat 50 G is an Economy Class seat in the last row of the plane. This seat may have limited recline and the close proximity to the galley and lavatories may be bothersome. 50 J None No Power Seat 50 J is an Economy Class seat in the last row of the plane. This seat may have limited recline and the close proximity to the galley and lavatories may be bothersome. 50 K None No Power Seat 50 K is an Economy Class seat in the last row of the plane. This seat may have limited recline and the close proximity to the galley and lavatories may be bothersome. 6 A None No Power Seat 6 A is a standard Business Class Bulkhead seat. Passengers traveling with infants are often seated here as there are bassinets located in this row. 6 B None No Power Seat 6 B is a standard Business Class Bulkhead seat. Passengers traveling with infants are often seated here as there are bassinets located in this row. 6 D None No Power Seat 6 D is a standard Business Class Bulkhead seat. Passengers traveling with infants are often seated here as there are bassinets located in this row. 6 E None No Power Seat 6 E is a standard Business Class Bulkhead seat. Passengers traveling with infants are often seated here as there are bassinets located in this row. 6 F None No Power Seat 6 F is a standard Business Class Bulkhead seat. Passengers traveling with infants are often seated here as there are bassinets located in this row. 6 J None No Power Seat 6 J is a standard Business Class Bulkhead seat. Passengers traveling with infants are often seated here as there are bassinets located in this row. 6 K None No Power Seat 6 K is a standard Business Class Bulkhead seat. Passengers traveling with infants are often seated here as there are bassinets located in this row. 7 B None No Power Seat 7 B is a Business Class seat where the close proximity to the galleys behind may be bothersome. 7 D None No Power Seat 7 D is a Business Class seat where the close proximity to the galleys behind may be bothersome. 7 F None No Power Seat 7 F is a Business Class seat where the close proximity to the galleys behind may be bothersome. 7 J None No Power Seat 7 J is a Business Class seat where the close proximity to the galleys behind may be bothersome. 8 A None No Power Seat 8 A is a standard Business Class Bulkhead seat. Passengers traveling with infants are often seated here as there are bassinets in this row. 8 B None No Power Seat 8 B is a Business Class Bulkhead seat however the close proximity to the lavatories and galley may be bothersome. Passengers traveling with infants are often seated here as there are bassinets in this row. 8 D None No Power Seat 8 D is a Business Class Bulkhead seat however the close proximity to the lavatories and galley may be bothersome. Passengers traveling with infants are often seated here as there are bassinets in this row. 8 E None No Power Seat 8 E is a Business Class Bulkhead seat however the close proximity to the lavatories and galley may be bothersome. Passengers traveling with infants are often seated here as there are bassinets in this row. 8 F None No Power Seat 8 F is a Business Class Bulkhead seat however the close proximity to the lavatories and galley may be bothersome. Passengers traveling with infants are often seated here as there are bassinets in this row. 8 J None No Power Seat 8 J is a Business Class Bulkhead seat however the close proximity to the lavatories and galley may be bothersome. Passengers traveling with infants are often seated here as there are bassinets in this row. 8 K None No Power Seat 8 K is a standard Business Class Bulkhead seat. Passengers traveling with infants are often seated here as there are bassinets in this row. Every seat in First and Business Class is equipped with a regular 110v AC power port. It is possible that some versions of this aircraft will not have powerports. Emirates operates this 777-300ER aircraft in three different configurations. This version operates in a three class layout and reflects the newest configuration and retrofit of this aircraft type. To verify the correct version of this aircraft at the time of booking or at online check-in, the following rows may be used as reference: First Class are rows 1-2; Business Class are rows 6-11 and Economy extends from Row 17-50 with 310 seats. Click here for Emirate's online tool to identify operating aircraft type by flight or route. In this newest version of the 777-300, all classes feature Emirates ICE inflight entertainment system. First Class suites have sliding doors; Business Class are angled lie-flat seats. i FOUND THIS SEAT TO BE NARROW on the 777 - 300ER, as I sat in the seat I was unable to place my arms down beside me so not as good as the Qantas A330-300 for my flight over on QF23 which has a 1-2-1 seat configuration and these are lie flat and much wider the Emirates are angle lie flat. So I wont be chasing Emirates Business if I have choice of Qantas on this leg. Seat OK - view free of the wing. Pretty narrow though. I was travelling solo and had 49B, close to the toilets but not too bothersome. Will not be taking this flight again, seats far too narrow and less leg room for my size, Im a UK size 22. Didn't get hardly any sleep on this flight, too uncomfortable. Not a bad seat, in the mini cabin near the front so not a bit quieter. I didn't find any problems with the recline, but this seat is fairly close to the toilets, not that I found it to be an issue. If you're tall/have a long torso and broad shoulders, DON'T BOOK A WINDOW SEAT (A or K) on any of the Boeing 777. The shape of the plane curves around and your shoulders will be pinned against the wall/window as there's no recession on these planes. I'm 6ft7 and had to ask the guy beside me to swap as it was so uncomfortable - I literally couldn't move that arm at all. The A380 seats are much better and have space and an armrest between the plane wall on the lower level. I had a night flight on this one. Seat was excellently located, quiet and spacious. You can hear the flushing of the lavatory but apart from all the other noises on board this was not an issue. I have my own noise canceling headphone. There was no one in seat 21B which added to the comfort. IFE is incredibly generous, the food was just OK and drinks were limited. I slept most of the time. Crew was friendly. Definitely a good place in the aircraft, this little secluded section just behind Business class and right on the wings. The aircraft I was in was immaculate. This business class seat as well as 8B sticks out in the aisle and when you have your feet out you tend to get bumped by other passengers returning from the toilets. worst seat ever experienced on long-haul flight. European budget airlines Ryanair, EasyJet and Jet2 are much more comfortable and only for 1 to 4 hours. Terrible seats and to add insult to injury you pay extra for the legroom. Travelled on this flight earlier this year and of all the seats I had on this trip this was the worst. Will never pay extra again for an exit row seat on this plane again. Will take my chances with a regular cattle class seat. all K seats (and I guess also A ones) have limited feet space for some box under the infront seat - i think it is the entertainment box. The plane is in general pretty bad, old, not wide, bad screens. 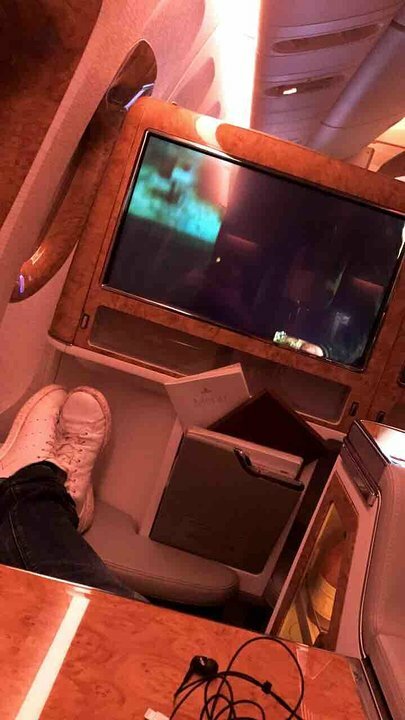 Worst seat I have had an Emirates flight. More narrow than the others in the row so difficult to get into and out of it, notwithstanding the bulkhead leg space. Tucked into the exit door so no window. Minimal storage space above, and the monitor in the armrest needed to be re-booted twice during the flight. Def not worth the upcharge! Due to the row being angled compared to the row in front, the setup is different to all other rows. The tray tables are in the arm rest meaning the arm rests do not fold up. Additionally, the screens are out of alignment with the seats which can make them a bit awkward to watch. Finally the gap between the aisle arm rest is quite small (again from the angled seats) making getting in and out awkward. Some positives are that 46A seems to have more legroom than most economy seats, the aisle here is wide which means you can stand in the aisle when sorting out bags without blocking it and because the row in front is 3 seats wide, you get extra under seat storage. There is still a tray table on the back of the seats in front meaning you can use both the arm rest tray table and half the seat rear tray table quite comfortably (they won't both fully open at the same time). was seated here for a 6 hour flight. Yes, screen is on an angle, but didn't find it a problem. More legroom due to the angle on window seats in this row. Additional tray table in the armrest, for me the best seat. I recently spent 15' sardined into a Cathay/Pacific B777 and it was horrible. It hurt my back & ruined my Vaca in Japan. The pitch I measured was closer to 31 than the 32 claimed here. AirBus 350 offers 3" more & was comfortable, supportive & fine for my return. Same 15 hours. Dubai to Accra. First time on the Emirates 777 fleet and a little disappointed to be fair. First the good bits, service as always was excellent from all of the cabin crew and the large good quality ICE system made the journey. However, the seat layout is way below par. HAving a window seat means climbing over the person in B or J to get out if they are resting. Also lack of space to store anything in the seat area (phone, glasses and drink) mean you're having to do a juggling act. The seat feels very narrow and is very uncomfortable in comparison with the 380 BC seats, this is compounded by the fact that's it's an angle flat, not fully lie flat. Also for a tall chap the foot rest section doesn't come out far enough to make laying comfortably an option. Think Emirate would do well to look at updating their business offering on this aircraft soon. Excellent seat. Lots of room and privacy. The seat is right behind the first class wall seperator so its quiet. No bathroom access or food service in this area. Screen is located on the wall and there is no storge in front for take off. Far enough from the engine for a quiet smooth ride. Also there is so much room in the front its very easy to get into the isle. I would mark this one green. The bulkhead for seats 17C and 17H only extend half way across these seats thus there is extra legroom through the curtain under the business seat in front of you. Flew this aircraft last saturday, BRU - DXB. It took more than 1 hour after takeoff to get the first drink, not acceptable when you pay a high price for businessclass. For the rest everything was fine. This was first time I flew economy with Emirates (usually business). Seat 24C does have substantial extra leg room (there is a crew seat there for takeoff and landing). But there is no power socket, you have to stow ICE screen for takeoff and landing and everybody bumps into you as they pass - even some of the crew! At bulk head so danger of families with small children. 24 A or C would be better - you can still get in and out without disrupting anybody. In general, seats in economy very narrow! I flew GLA-DXB, DXB-CPT and DXB-GLA on this plane in March/April and found it quite comfortable for both sitting and sleeping. The extra mattress provided after take-off really does help in evening out any irregularities and the very slight angle of the lie-flat bed didn't affect me at all. The service from the cabin crew was excellent and the meals of a high standard with a good choice of dishes. Whilst the 2-3-2 layout is possibly not the best layout, I didn't find that sitting in the window seat presented any real issues in getting out into the aisle. Personally I tend not to bother with the in -flight entertainment (ICE) but from what I looked at on this flight it was very extensive including the live TV which was very good in keeping up with world events via BBC World When taken in conjunction with free chaufeur drive to and from the airport for business class customers I would certainly fly with Emirates and in this aircraft again. I couldn't have imagined the flight in this seat if I had not had noise cancellation with my Bose over-the-ear headset! The seat is in front of the engine and it is extremely loud. The service was incredible, (like always) and the food was great. However, the location of this seat would be a nightmare if the passenger doesn't have a quality noise cancellation available in their headset. Emirates 777 business seats are so far behind the other Gulf airlines with its 2-3-2 config leaving so many without direct access to get out. 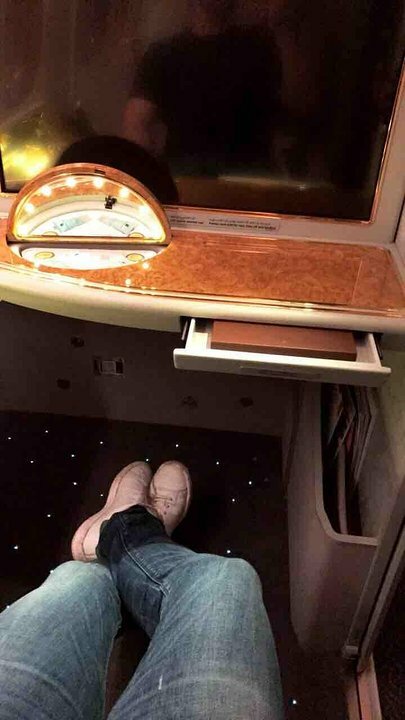 Flew on AAs new business config (MIA-LHR) and it was absolutely fantastic in comparison with the poor offering from Emirates on it's ageing 777 fleet. This seat is great as you can see over the wing. The ICE system is great, as well as the Wi-Fi. But try to fly on the A380 if possible as the seat is way too narrow in the 3-4-3 configuration. The main plus for this plane is the generous foot room. The Seats were not that good. The crew was really unprofessional and didn't come by once to clear our trays. The Bed was terrible compared to Singapore Airlines and even American Airlines. Emirates needs to step up it's game. Flew a 4 hour Redeye to Kochi India. Window seat but without the inflight entertainment box under the seat in front to cramp your toes, so plenty of foot space. Screen on back of seat was good too, with inflight power available. Seats a tad narrow, but if you sit next to someone who isn't a burly man (like me) then it's ok.
we had 8J and 8K on our way on the Emirates plane - (3 class plane) and because they were on the front wall, yes there was heaps of leg room (but all the business class were certainly not lacking in that area), but the computer screen is actually IN THE WALL, rather than having it right in front of you (coming out from your turnstyle) so I had to keep my glasses on when I wanted to watch anything. We actually had the same seats booked for our return, but I quickly rebooked it for 9J and 9K when we landed, and the service was great, the food was great and the seats were uber comfortable. Cannot fault Emirates service in business class at all! I traveled from BKK to SYD in Business class. Being a window seat there is less room to move around without disturbing the person on the aisle seat. The entertainment system has an extensive selection but the navigation around it all take a bit to get used to. The food in business class was excellent. The seat were less comfortable than I expected but it was still not bad at all. The in flight wi-fi at 1 US dollar were excellent with 500MB of data much more that oversea pack you buy for 5 days from Telstra. Highly recommended but I think 8 K is the better seat as it seems to be more room. Really uncomfortable and unpleasant chairs in economy - they look dirty and are hard. As far as I could see all the window seats have massive AV boxes bolted to the seat in front that use up over half the leg space. Really painful on a 7 hour + flight. Ok, im a big guy. I'm 6'4" and 280lbs, so never exoect to be as comfortable as a skinny short person. 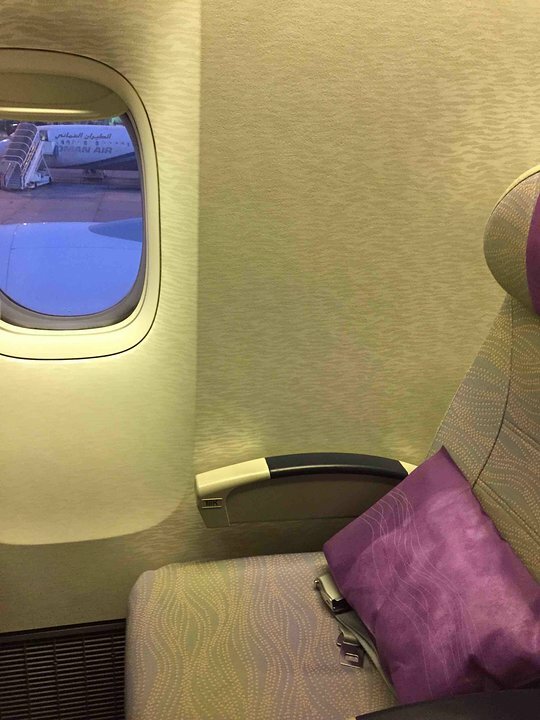 But just got back from bangkok, and this plane was fir the 7 plus hour leg from dubai, and the seat was awful. My knees were pushed up against the seat in front, and it was narrow and cramped. coudnt wait to get off the plane. Worst economy cabin in the sky. Seats are very narrow and cramped. In flight service was ok, but not as good as Asian airlines such as Thai, Singapore and Malaysia. If Emirates continue to use the 777 on this route, I'm staying well clear of them. This seat does recline, standard leg room but there is quite a gap between bulkhead and seat allowing you to at least stretch out your left leg! Didn't find the galley or toilet traffic a problem. The worst seats ever. Cramped and claustrophobic. Every time someone used the restroom the noise of doors and flushing would disturb us. And when the passenger in front reclines their seat into your already cramped space it leaves you with no room at all. Dreadful and Emirates should really do something with these seats. I am well used to exit seats due to excessive height. However I have never had such a narrow seat before. I am not in anyway oevrweight but my hips brushed the sides when sitting down and at mealtimes it was impossible for all 3 of us to eat at the same time except by using a knife and fork with your elbows sticking into your chest. Try it!! This is a wonderful seat, especially if you're as tall as I am (6ft8)! The proximity to the toilets may be bothering if you're on a daytime flight. I was on a night-flight, so many people (including me) were sleeping. The seat is a bit narrow though, as the TV-screen and the table are stored in the armrest. But I'd choose this seat again, the extra legroom is worth a narrower seat! OK seat. I struggled to adjust the lumbar/seat length to get a good position. On the aisle, but the person on the window can easily step over the end of the seat even when fully reclined. Bed was moderately comfortable but not great. Possibly the most uncomfortable cabin in the sky, emirates economy on the 777 is worse than any 'budget' airline. The seat is too narrow (cabin not wide enough for 3-4-3 layout)and legroom very poor, and I am only 180cm tall. A trip from Aus to UK on this plane was a nightmare. Never again, Qantas every time. I would not recommend the middle seat on a full row, but no problems when one of the aisle seats is vacant, which is usually the case on this flight. My flight had the updated seat with better ICE-system (touchscreen + tablet + remote) and felt more comfortable (better padding) then the older seat. 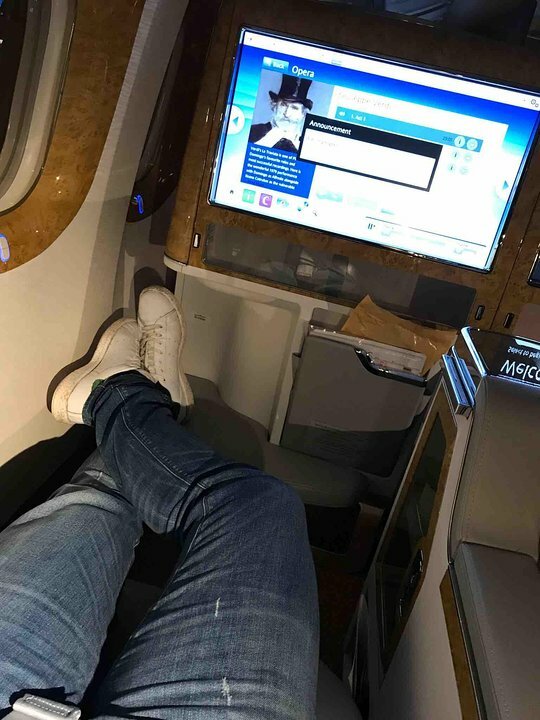 Business seats on Emirates are relatively narrow compared to other airlines. The back row of the business cabin suffers from noise from the economy cabin since row 17 is a bassinet-row where passengers with children sit. This is the most uncomfortable long haul flight I have flown in a long long time. The cramped 17"width seat meant I was fighting not for the arm rest with my neighbour but just breathing space as they were slightly large build. Older ICE system as well with 2 boxes under foot. Very uncomfortable and will never fly Emirates again if this is the aircraft available. 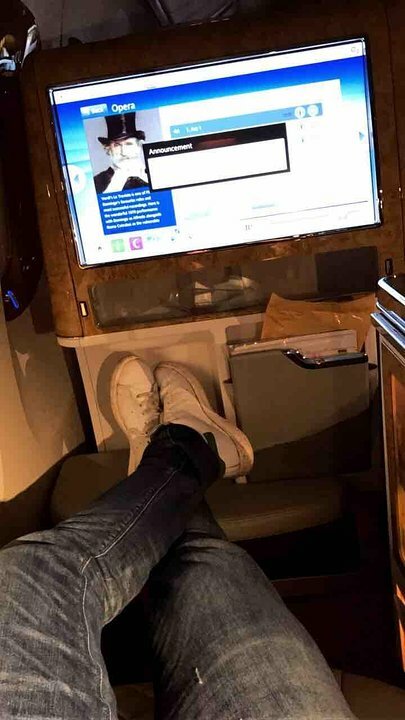 This seat was really comfortable considering that I was on an afternoon/evening flight with emirates to Dubai from London Gatwick. I was sitting in the new generation of economy seats for The boeing 777-300er. You could hardly hear the toilets when sitting in that seat. This seat also had a USB input so I could either charge my phone or watch my own videos. I was really impressed by the hand held remote controller because you could have flight progress on the remote while you watch a movie so you could track the flight which you are on. Very impressed! As all emirates flights the food was good it was chicken tandoori served with sauteed vegtables. desert was Sticky toffee torte :) ! The seat lines up with a bulge in the cabin wall behind the window, restricting shoulder space. Once reclined, it is a bit better, but still not good for passengers with wide shoulders.